As the number of employers offering a defined-benefit plan continues to decrease, the primary responsibility for saving and planning for retirement has shifted toward the individual. Employees that have access to a defined-contribution plan have several basic but important decisions to make: whether to participate in the plan, how much to save, and how to invest their savings. Fortunately, for today’s participants, choosing how to invest their savings has become a much simpler decision. The evolution of professionally managed solutions, such as target date funds, has helped to address the investment variable in the retirement readiness equation for many plan participants. However, given the uncertainty of future investment returns, it is critical that participants maximize the other variables they can control, namely how much and how long they save. In response to the shift towards personal responsibility for saving, plan fiduciaries have intensified efforts to help participants make choices that will lead to more successful retirement outcomes. We will examine the ways that plan sponsors can help participants, with varying levels of engagement, save for retirement at healthy levels. It has been well established that many participants are “accidental investors” who lack the time, interest, or expertise to make well informed investment decisions. As such, participants who are left to make their own investment decisions may fall prey to common investment mistakes, such as maintaining inappropriate diversification among menu options or transferring retirement savings to areas of the market simply based on strong short-term performance (i.e., performance chasing). In fact, studies of retirement plan participants have repeatedly shown that even with education, many participants are inadequately equipped to make the decisions necessary to successfully manage their retirement portfolios. Recognizing the damaging participant behavior that was taking place, pioneers in the life cycle industry developed professionally managed, easy-to-understand investment solutions to address the needs of the increasing number of participants that began to rely more heavily on their defined contribution plans to save for retirement. As directed by the Pension Protection Act of 2006 (PPA), the Department of Labor’s final regulations governing Qualified Default Investment Alternatives (QDIAs) have accelerated the trend toward professionally managed portfolios that began in the mid-1990s. With the PPA’s passage, an increasing number of disengaged participants now have their contributions directed into professionally managed portfolios through automatic enrollment in their plan’s QDIA. Likewise, a significant number of participants are choosing to invest in professionally managed portfolios on their own. Of the various types of professionally managed portfolio solutions available today, industry asset flows indicate that target date portfolios have generally emerged as the predominant choice among plan fiduciaries. Target date portfolios have gained popularity largely as a result of their use of glide paths. The glide path mechanism (i.e., typically decreasing exposure to stocks and increasing exposure to fixed income as the target date nears) generally relieves participants of making future investment decisions as their investment objectives change over time. The anticipated benefits associated with target date portfolios have begun to filter through to defined contribution plan data. For example, analysis by a number of record keepers has shown that participants invested in target date portfolios have less extreme asset allocations, on average, than participants making their own investment decisions. The defined contribution industry has clearly spent a tremendous amount of time and resources on developing investment solutions with the intent of improving the retirement security of participants. Unfortunately, an alarmingly high percentage of participants’ portfolio balances continue to fall below the projected levels necessary to provide an adequate retirement. For example, EBRI projects that roughly 42% of Baby Boomers and Gen Xers (i.e. individuals born between 1948 and 1974) will not have enough retirement savings to cover basic expenses and uninsured health care costs1. The growing usage of professionally managed solutions, such as target date portfolios, has undoubtedly played an important role in decreasing the number of individuals at risk by 7-10% from EBRI’s 2003 projection2. However, to see more meaningful progress, a greater number of participants will need to engage in healthier savings behavior. The importance of saving for retirement can’t be overstated as saving early, adequately, and consistently are primary determinates of retirement success or failure. Some participants may believe that they can overcome a savings shortfall by generating higher investment returns. However, the much more prudent and reliable way to combat an uncertain future return environment is to save more. 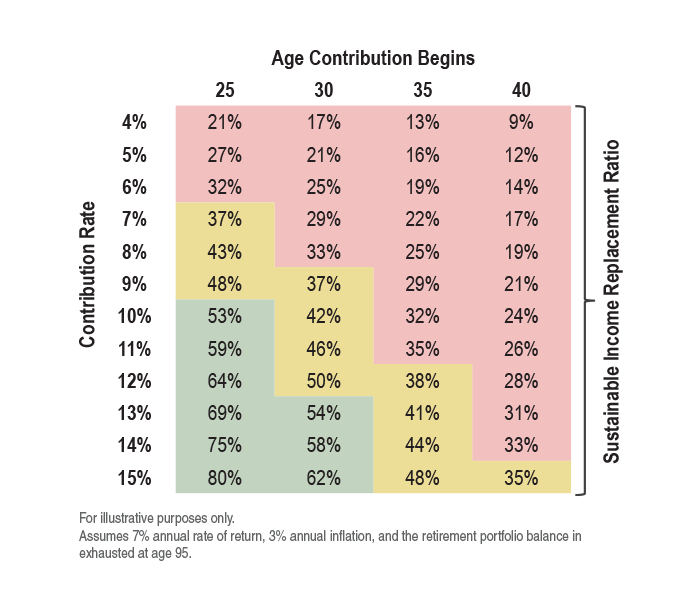 The following chart illustrates the impact savings behaviors (i.e., the age at which participants begin saving and at what rates) can have on a participant’s ability to generate lifetime income. Specifically, the percentage of a participant’s final working year’s salary that they are able to replace in retirement is illustrated. As you can see, the higher the contribution rate and the earlier a participant begins saving, the higher the sustainable replacement rate. As a general rule of thumb, in addition to any Social Security income received, participants will likely need to replace 50% - 70% of their final working year’s salary to meet their retirement spending needs. Participants face a variety of challenges and more immediate responsibilities such as paying for housing, food, and student loans, which make it difficult to prioritize saving for retirement. However, retirement success hinges on being able to strike the right balance between current spending needs/desires and being able to delay gratification and prioritize saving for their future. Luckily, as will be discussed in greater detail, tools and resources that address debt, budgeting, and other barriers have been found to be helpful in overcoming participant saving hurdles. Likewise, through the use of automatic enrollment and escalation features, plan sponsors have the opportunity to reach a significant percentage of eligible participants who delay enrollment into their employer’s retirement savings plan and increase their savings rates over time. The importance of adequately saving for retirement is only growing. In fact, these long-term trends suggest the need to aggressively encourage participants to boost their savings rates has reached critical status. There is uncertainty in the future availability of Social Security and Medicare benefits, with many individuals anticipating diminished benefits for future generations. In an attempt to maintain the solvency of Social Security, we are in the midst of a gradual increase in the age that full retirement benefits are received, from 65 to 67. Since Social Security is a progressive system, any future changes will likely have the greatest impact on low-income earners, who often rely almost exclusively on these benefits to fund their retirement. Health care costs continue to rise faster than general inflation. This trend is particularly troubling for retirees since health care-related costs often represent a growing portion of overall spending as one ages. According to EBRI, today, a 65-year-old couple with median drug expenses would need approximately $158,000 to have a 50% chance of meeting their medical expenses throughout retirement and approximately $259,000 to have a 90% chance3. The financial impact of post-retirement health care expenses is often overlooked or at least understated by many participants when planning for retirement. Medical advances are helping individuals live longer. For a married couple at 65 years old, there is a 50% chance that at least one of the spouses will live to age 904. Continued increases in life expectancy require participants to accumulate more retirement savings than previous generations did, or risk outliving their retirement assets. With current interest rates near historic lows, it may be challenging going forward to replicate returns achieved from U.S. government bonds over the last 30 years (both from an income and total return perspective). In addition, while bonds have provided and may continue to provide stability and downside protection to multiple asset class portfolios during equity market drawdowns, the effect of those attributes will likely be much weaker given today’s low yields. As such, the prevailing market environment suggests participants should plan on increasing contributions as a way to offset potentially lower total returns going forward. Some participants may plan on addressing any savings shortfalls by working longer. Participants who delay retirement gain additional years of continued contributions to their retirement portfolios, while potentially benefitting from rising capital markets. In addition, they reduce the number of years their retirement portfolio needs to generate income, and may delay filing for Social Security benefits, resulting in larger monthly payments down the road. Unfortunately, many participants may not be able to postpone retirement as long as they would like, often due to health-related issues. Without significant changes in savings behavior, an increasing number of retirees will be facing a retirement that is likely to fall short of what they envisioned. Through the use of automatic features, plan sponsors have the opportunity to reach a significant percentage of the eligible participants who are delaying enrollment into their employer’s retirement savings plan. For example, plan sponsors are likely to see an increase in plan participation by simply reframing the retirement saving question and requiring plan participants to opt out of participating in the plan, rather than having them make the pro-active decision to opt into the plan. This seemingly small procedural change has proven to have a significant impact on retirement outcomes. For example, one study showed that the adoption of automatic enrollment led to increases in plan participation by as much as 41% among new hires5. The passage of the PPA was an influential step toward more appropriate participation and savings rates for disengaged participants. However, automatic features do not appear to be utilized as extensively, or effectively, as they could be. To this point, the following observations are based on data obtained from the Plan Sponsor Council of America’s (PSCA) annual surveys reflecting plan experiences from 2003-20146. Use of Automatic Enrollment - In 2014, 52% of plans had automatic enrollment features. 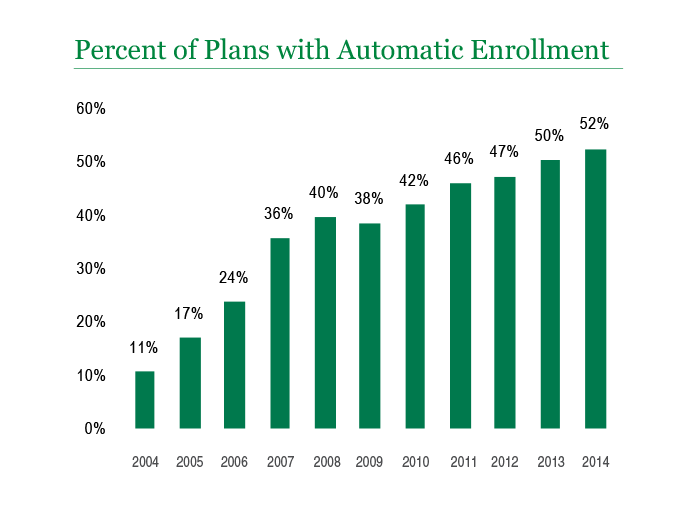 As illustrated in Figure 2, while the share of plans with automatic enrollment features increased substantially in the years leading up to and immediately following the PPA’s passage in 2006, growth has decelerated over the past few years. Breadth of Participants Reached - Of those plans that had an automatic enrollment feature in 2014, 96% used this feature with new hires only. Therefore, the current workforce, which often includes a significant number of older, established workers who are not participating in the plan, is not reached through automatic enrollment features. This is important to note because the longer participants spend contributing to retirement savings plans, the more likely they are to attain retirement savings goals. Common Default Contribution Rates - While many plan sponsors recognize the need for increased participant savings rates, only 40% of automatic enrollment plans adopted a default contribution rate of more than 3% in 2014, up from 26% in 2010. Therefore, the vast majority of plans default participants well below the rate likely required to provide a secure retirement. Use of Automatic Escalation - In 2014, 40% of plans that had an automatic enrollment feature also employed non-voluntary automatic escalation of participants’ default contributions. The share of plans with automatic escalation features has remained low and stable over the past five years, ranging from 35% to 40%. Common Contribution Escalation Rates - Of those plans that had a non-voluntary automatic escalation feature in 2014, 36% capped the maximum contribution rate at 6%, which is the most cited employer match rate. While in the past 6% was the most prevalent capped contribution rate, a growing number of plans have adopted a rate of 10% over the past 5 years (up from 18% in 2010 to 40% in 2014). This shift in capped rates may signal that plan sponsors recognize that participants have the capacity and need to contribute at much higher savings rates than in the past. Plan sponsors may be reluctant to embrace all three of these actionable steps. For example, some plan sponsors may be concerned that by increasing the default and automatic escalation rates, a growing number of participants will opt out of their retirement plan. However, we are unaware of any definitive evidence that indicates higher default rates result in higher opt-out rates. While plan sponsors may be unable to persuade all eligible employees to enroll in their retirement savings plan immediately, as a person ages, they tend to gain general financial experience, which may eventually include a better understanding of the importance of saving for retirement. Therefore, a more persistent approach to automatic enrollment, such as the periodic re-enrollment of those who opt out, may be an effective way to reach disengaged employees. Additionally plan sponsors may want to consider the repercussions of settling on a default contribution rate that, short of abnormally strong and sustained market returns, provides participants with very little chance of achieving desired retirement outcomes. Furthermore, given that defaulted participants tend to remain disengaged (i.e., continue to contribute at the default rate), it is likely that there are some participants who would have eventually chosen to contribute to the plan, potentially at higher contribution rates. Because of automatic enrollment at inadequate contribution rates, those participants may actually be worse off in the end. Once plan sponsors adopt automatic features and implement them at adequate rates, the next step is to encourage disengaged participants to take on a more active role in managing their retirement savings strategy. This can be accomplished through the same communications program that is used to reach their more engaged counterparts. It is equally as important for employers to communicate with employees already enrolled in the retirement savings plan as it is to engage non-active and new employees. Participants who proactively enroll in their employer’s retirement savings plan likely recognize the importance of saving. By continuing to engage currently enrolled employees, employers have the opportunity to pass along valuable information to help motivate participants to potentially increase their savings rates. However, it’s understandably easy for participants to delay increasing their savings rates in order to tend to what they consider more urgent responsibilities, such as paying for housing, food, and student loans. These types of financial pressures have been a mainstay in participants’ lives and are likely a major reason why average contribution rates to defined contribution plans have remained low, ranging from 4.2% to 5.8% among non-highly compensated participants over the past 20 years6. By adopting the following plan design features and communication strategies, plan sponsors may have greater success in encouraging active participants to increase their contribution rates. Promote the use of voluntary automatic escalation features to help combat savings rates that have not been increased over the years. Even highly engaged participants may set their initial contribution rate and fail to revisit the decision often enough as the demands of daily life get in the way. Participants may find that, through pre-planned incremental increases (e.g., 1%-2% annually), they will quickly progress toward adequate savings levels without any noticeable changes in their disposable income. Features that make it easier for participants to automatically increase contribution rates whenever they receive salary raises or bonuses can have similar effects on savings rates. Alter employee match provisions to encourage higher savings rates. A common rule of thumb embraced by participants is to contribute the minimum amount necessary to receive the full employer matching contribution. According to PSCA, of plans with fixed matching formulas, 39% match $0.50 per $1.00, most commonly up to the first 6% of a participant’s salary (i.e., 21% of all fixed matching plans in 2014)6. Since the employer match is a key motivator for participants to contribute to a retirement savings plan, employers should consider stretching the match to a higher percentage of pay. For example, the typical match of $0.50 per $1.00 up to 6% could be increased to $0.25 per $1.00 up to 12% of a participant’s salary, at no additional cost to the employer. Tailor communications to participants based on age group and projected years to retirement. Reach participants through their preferred communications channel. Targeted messages can be sent by traditional methods, but, more recently, electronic forms of transmission (e.g., e-mails, text messages, and automated phone messages) are becoming commonplace. For example, retirement plan service providers have developed technology-based content and tools that can be accessed through mobile devices. This may be an effective medium to communicate with a plan’s younger demographic. Limit communications to important messages only. Participants are more likely to view the targeted messages as important correspondence that they should take the time to read and process. Provide holistic assessments of participants’ financial wellness. Increasingly, plan sponsors have recognized that participants’ retirement outlook and overall financial wellness are intertwined and should not be treated as two separate issues. Participants need both guidance on their retirement account and help with their overall financial planning. Furthermore, that guidance should align with the stage of career participants are in, as issues that impact an older participant may not impact younger ones. Generally speaking, there are three stages that a participant base can be divided among: Early Career, Mid-Career, and Late Career. Early Career: Participants may benefit from an introduction to basic finance-related concepts like maintaining a good crediting rate, managing student loan payment schedules, and effective budgeting techniques to help identify areas where additional saving is possible. Mid-Career: Participants may need help prioritizing where to allocate their savings and how much. Specifically, how much to allocate to their retirement savings vs. saving for their children’s college educations. Late Career: Participants may need assistance looking towards the future with an emphasis on financial planning issues such as identifying income and spending needs, insurance, and tax/estate planning. Regardless of which stage participants are in, they should have a clear understanding of what they may need to maintain their standard of living in retirement and what is required to achieve those goals, whether through the use of retirement planning tools or access to a financial professional. With advances in professionally managed portfolios, plan sponsors are able to shift their focus toward educating participants on the need for increased savings. By starting early and saving at adequate rates, participants take advantage of the best risk management tool available for reducing the likelihood of adverse retirement outcomes. To ensure that an increasing number of both disengaged and active participants reach their retirement goals, plan sponsors should tailor their approach to both groups, and leverage the tools and services available today to better engage and promote increased savings. Manning & Napier’s life cycle offerings include target date (age-based) and lifestyle (risk-based) mutual funds (Manning & Napier Fund, Inc. Target Series and Pro-Blend® Series) and affiliate collective investment trust (CIT) funds (Manning & Napier Pro-Mix® CIT Funds, Retirement Target CIT Funds, and MANNING & NAPIER GOAL® CIT Funds). Because life cycle funds invest in both stocks and bonds, the value of your investment will fluctuate in response to stock market movements and changes in interest rates. Investing in life cycle funds also involves a number of other risks, including issuer-specific risk, foreign investment risk, and small-cap/mid-cap risk as the underlying investments change over time. Investments in options and futures, like all derivatives, can be highly volatile and involve risks in addition to the risks of the underlying instrument on which the derivative is based, such as counterparty, correlation and liquidity risk. Also, the use of leverage increases exposure to the market and may magnify potential losses. Additionally, some target date funds invest in other funds and therefore, may have additional risks associated with the underlying funds. Principal value is not guaranteed at any time, including at the target date (the approximate year when an investor plans to stop contributions and start periodic withdrawals). Manning & Napier Advisors, LLC (Manning & Napier) provides investment advisory services to Exeter Trust Company (ETC), Trustee of the Manning & Napier Collective Investment Trust funds. The Collectives are available only for use within certain qualified employee benefit plans. The Manning & Napier Fund, Inc. is managed by Manning & Napier. Manning & Napier Investor Services, Inc., an affiliate of Manning & Napier and ETC, is the distributor of the Fund shares. 1”What Causes EBRI Retirement Readiness RatingTM to Vary: Results from the 2014 Retirement Security Projection Model®,” Employee Benefit Research Institute, No. 396, February 2014. 2“Retirement Income Adequacy for Boomers and Gen Xers: Evidence from the 2012 EBRI Retirement Security Projection Model,” Employee Benefit Research Institute, Notes, May 2012. 3“Amount of Savings Needed for Health Expenses for People Eligible for Medicare: Unlike the Last Few Years, the News is Not Good,” Employee Benefit Research Institute, Vol. 36, No. 10, October 2015. 4National Vital Statistics Reports, Vol. 64, No. 11: United States Life Tables, 2011. 5“Measuring the Effectiveness of Automatic Enrollment,” Vanguard Center for Retirement Research, Volume 31, December 2007. 6“47th – 58th Annual Survey of Profit Sharing and 401(k) Plans,” Plan Sponsor Council of America, 2003-2014 data.